The “RiffTrax Live” cinema series has been racking in the “LOLs” and “ROTFLs” with its celebrated comedic treatment of films since 2009. This fall, the stars of RiffTrax—Michael J. Nelson, Kevin Murphy and Bill Corbett (best known for the groundbreaking “Mystery Science Theater 3000”)—are back for a hilarious never-before-seen take on the George Romero zombie movie “Night of the Living Dead.” Movie theater audiences will witness shambling zombies (and lead actors alike) meeting their end via razor-sharp mockery, as NCM Fathom Events, RiffTrax and IGN present “RiffTrax Live: Night of the Living Dead” on Thursday, Oct. 24, live at 8:00 p.m. ET / 7:00 p.m. CT and tape delayed at 7:00 p.m. MT / 8:00 p.m. PT/HI/AK. 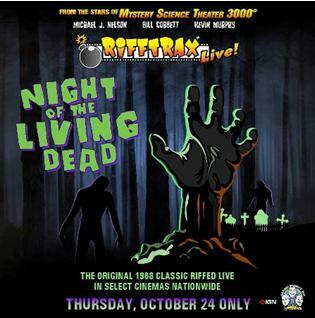 Tickets for “RiffTrax Live: Night of the Living Dead” are available at participating theater box offices and online at www.FathomEvents.com. The event will be broadcast to more than 600 select movie theaters across the country through NCM’s exclusive Digital Broadcast Network. For a complete list of theater locations and prices, visit the NCM Fathom Events website (theaters and participants are subject to change). A classic horror film, 1968’s “Night of the Living Dead” kicked off the ubiquitous zombie craze. The movie begins when Barbara and her brother Johnny travel to the countryside to visit their father’s gravestone. In the cemetery, Johnny is murdered by a peculiar man and Barbara must flee to an abandoned farmhouse. Also hiding from the zombies in the house is Ben, who boards up the doors and windows. After listening to the radio and learning that a satellite returning from space has reanimated the dead, Ben and Barbara discover five additional survivors hidden in the basement. Harry—one of the ragtag band of survivors—disagrees with Ben’s leadership, and the tension between the two men intensifies. As the group waits out the apocalypse, the house is besieged by an increasing throng of living dead.